Before you buy new, make the most of the quality furniture you already own. Find a great deal at a garage or moving sale? Update it with the style that fits you! Choose from our 50,000+ fabric samples and our talented team will bring new life to your furnishings. 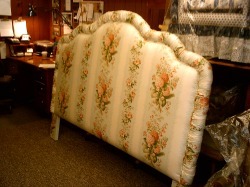 We also repair furniture, springs and replace foam to give your furnishings a good-as-new firmness and support.